Pretty, bright blue forget me not flowers are tied with a pink bow on this pair of pristine white bone china cup and saucers by York. Set of two bone china cups and saucers. 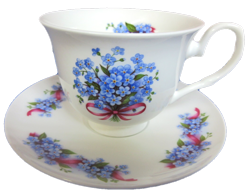 Pretty, bright blue forget me not flowers are tied with a pink bow on this pair of pristine white bone china cup and saucers trimmed in gold by York. The cups and saucers are dishwasher and microwave oven safe. The blue forget me not flowers symbolized romance associated with a tragic fate. Legend states that in medieval times, a knight and his lady were walking along side of a river when the knight spied a lovely cluster of blue flowers. He bent to pick the flowers to present to his lady when the weight of his armor caused him to fall into the river. As he was drowning he threw the flowers to his lady and shouted " Forget-me-not". Forget me not flowers are often worn by ladies as a sign of faithfulness and enduring love, so are often used in weddings as well as anniversary celebrations.